Hours of driving, the last of which was a jarring off-road experience, brought us to Achik-Tash Base Camp. 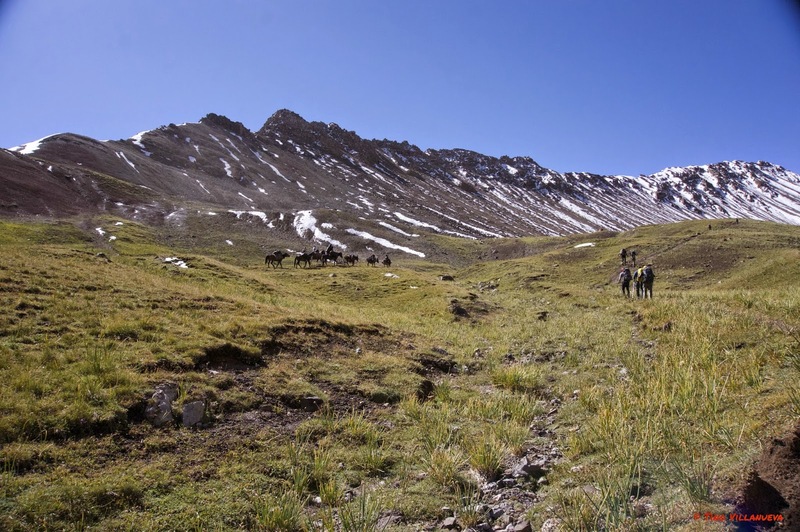 Set in an idyllic high mountain meadow at 11,000 ft, Achik-Tash, was a beautiful place to start the expedition. And after a day of acclimatizing, soaking in the views and enjoying the authentic yurt dining room, we left for higher ground. Horses carried the majority of our equipment up to Advanced Base Camp, where we would spend most of our time on the mountain. 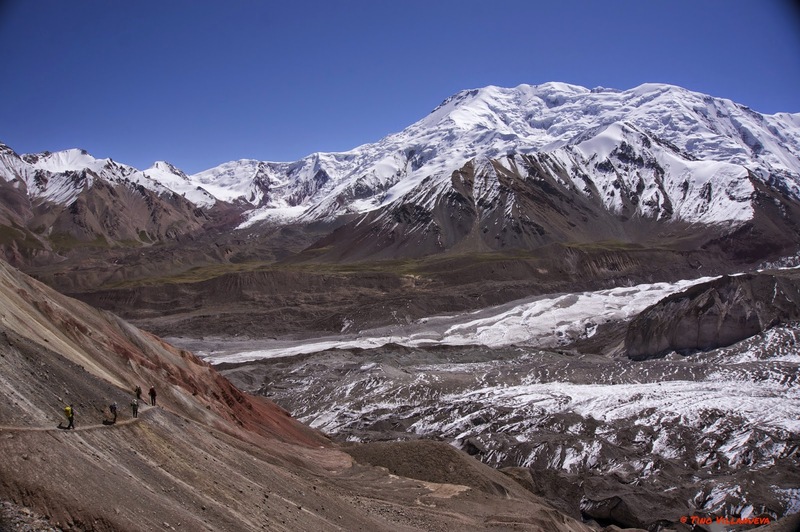 The trek to ABC traveled parallel to the massive Lenin Glacier, sometimes on a path literally cut into the mountain side in a lateral moraine through loose scree. Some areas were quite steep and subject to rockfall and even though we were attentive and moved fast through these areas, I was hit by a rock. This was not a place you wanted to fall and as the horses and riders passed with our equipment we were all glad to be walking instead of riding. Advanced Base Camp was tucked into a glacial moraine and the service and hospitality at 14,000 ft was excellent. Tasty local cuisine(better than the food in Osh!) and basic creature comforts made ABC a great spot to recharge before moving further up mountain. There was even a shower available in the camp and until I witnessed someone run out of the shower tent half-naked after nearly burning it down I even considered using one. Soon though, again, it was time to move upward. We planned for two rotations on the mountain. The first would have us staying at Camp 2 (17,000 ft), while acclimatizing and climbing to Camp 3, the high camp at 20,000 ft. The climbing on Pik Lenin is not difficult, but it is also not simply a slog. The first true climbing day from ABC to Camp 2 was tough. Steep and sustained glacier climbing, with an average slope angle of 30 degrees (and steeper steps) makes up the majority of the terrain covered. 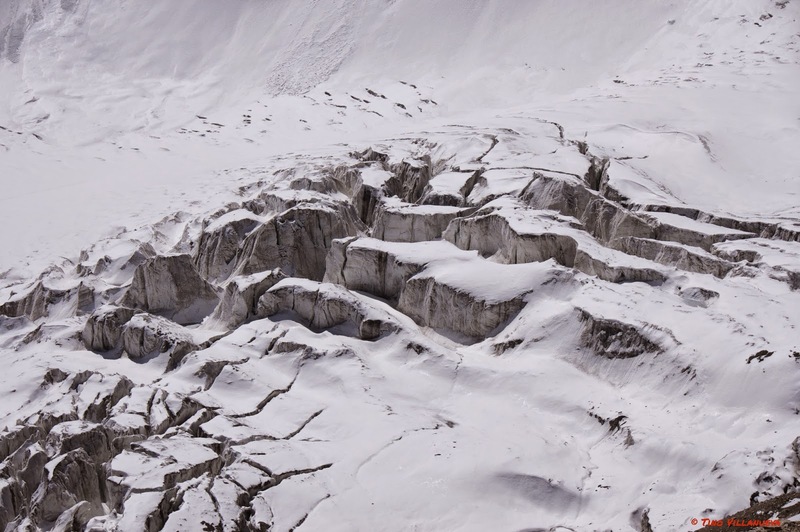 It is the sustained nature of the climbing that makes it strenuous, and though porters can be hired to ease the pain, that day took us 9 hours to climb 3000 ft. We climbed to Camp 3 the following day and returned to ABC the day after. Throughout the trip we had been experiencing convective afternoon snow storms. For the most part these squalls were light and inconsequential, though sometimes creating whiteout conditions. Upon return to ABC for two planned rest days, however, a bigger storm descended on the mountain and for nearly 24 hours the mountain disappeared behind a sea of grey, the sounds of the tide crashing unseen behind the wall of clouds. When the skies cleared we had 4 inches of snow on the ground in camp and a loose snow avalanche had run across the climbing route. Nothing terribly serious, but it was becoming clear that travel on the upper mountain may be tricky. 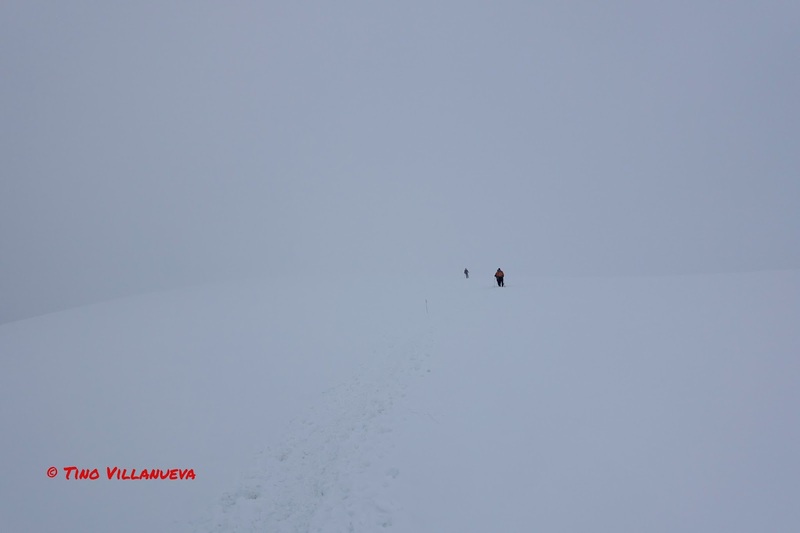 Returning to the upper mountain, it was evident things were not going to be easy. Brutal trail breaking from Camp 2 to Camp 3 robbed our team of energy. Even our porter, who had climbed to the summit from ABC in 6 hours, struggled and barely arrived before us into camp. The consecutive days of snow, and then wind, created a punchy snow surface that required everyone to break trail. Summit day arrived and we gave it our best effort. However, similar conditions, and a constant biting wind, conspired to make conditions too cold and to difficult to reach the summit. 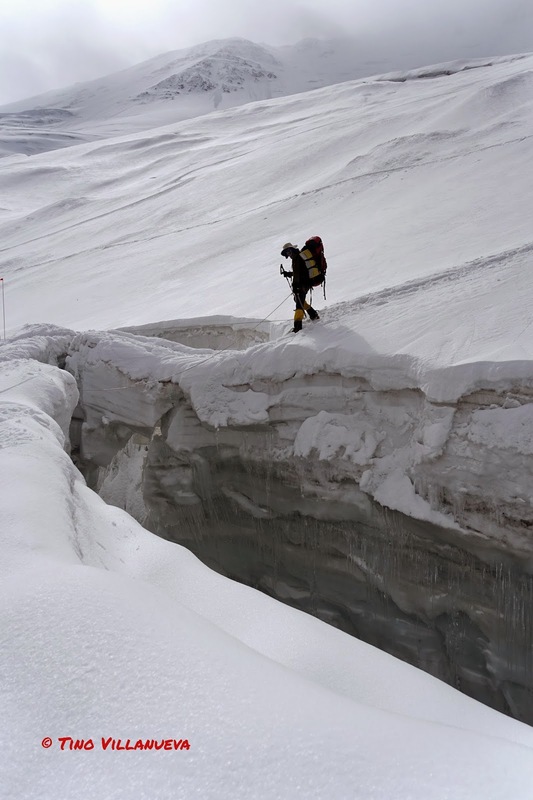 Every group that attempted the summit from Camp 3 returned empty handed, though one group that had camped higher returned with frostbite. After a huge effort, we climbed to 6700 meters and accepted that the mountain was not going to let us have our way this time. Despite not reaching the summit, I don't see the expedition as returning empty handed. Our team got to explore a deep corner of the world most will never see. We spent time with friends on a beautiful, massive mountain, testing our own limits. And most importantly we all returned safely home so we can do it again, somewhere else in this big world.